Peak Energy: Australia's "Dome of Heat"
The Economist has a look at Australia's record breaking heatwave at the start of the year, dubbed the "Dome of Heat" (which eventually resulted in a new record temperature for Sydney of 45.8 degrees) - Up to Eleven: An uncomfortable time for Australians, especially climate-change sceptics. IN OODNADATTA, an outback town in South Australia, the roads melted. Sydney, Australia’s biggest city, sweltered through heat of 42.3°C (108.1°F). In Tasmania, a Dunkirk-style flotilla of small craft swung into operation to rescue locals and tourists stranded by fires on the isolated Tasman peninsula. Australia’s summer-holiday season has barely begun. Yet a heatwave has swept across the country, smashing temperature records and raising questions both about the impact on annual weather patterns of global warming, and about Australia’s vulnerability to the changes. Heat is part of the national mythology. It killed some of the country’s first white explorers, and has sparked many devastating fires. The worst, “Black Saturday” in Victoria, killed 173 people four years ago. Thanks to better preparation, firefighting skills and a good dose of luck, fires raging in four states in the latest heatwave have spared humans. Yet Australia is getting ever hotter. The 2013 heatwave has set a new record, 40.3°C, for the highest national average temperature. So far, Leonora, a town in Western Australia, has been the hottest place of all, at 49°C on January 9th. That is still below the highest temperature ever recorded in Australia, 50.7°C at Oodnadatta 53 years ago. The authorities are preparing for such recordings as the new normal. 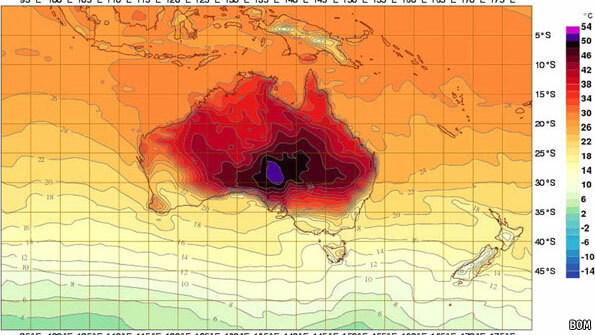 On January 8th the Bureau of Meteorology added new colours, purple and pink, to its weather map to denote temperatures once considered off the scale: 50-52°C and 52-54°C respectively. (In “Spinal Tap” parlance, it turned the knob up to 11.) The bureau says more “significant records” are likely to be set, with no end to the heatwave in sight.